Surfing Heritage & Culture Center: Venice Pier, Sept. 1940. Tommy Zahn collection. Picture by LeRoy Grannis of "Gecko Toes"
Venice Pier, Sept. 1940. Tommy Zahn collection. 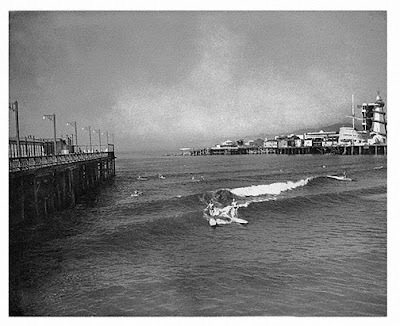 September 1940 - the surfing area just north of Sunset Pier, with Venice Pier visible on the right. Note the interesting architecture of the building in the background, possibly some sort of amusement ride. Photo from the Tommy Zahn Collection.